Burdocks in the late summer of their first year. When the first year plant is 3 months old it is ready to harvest. These are perfect for harvesting roots. 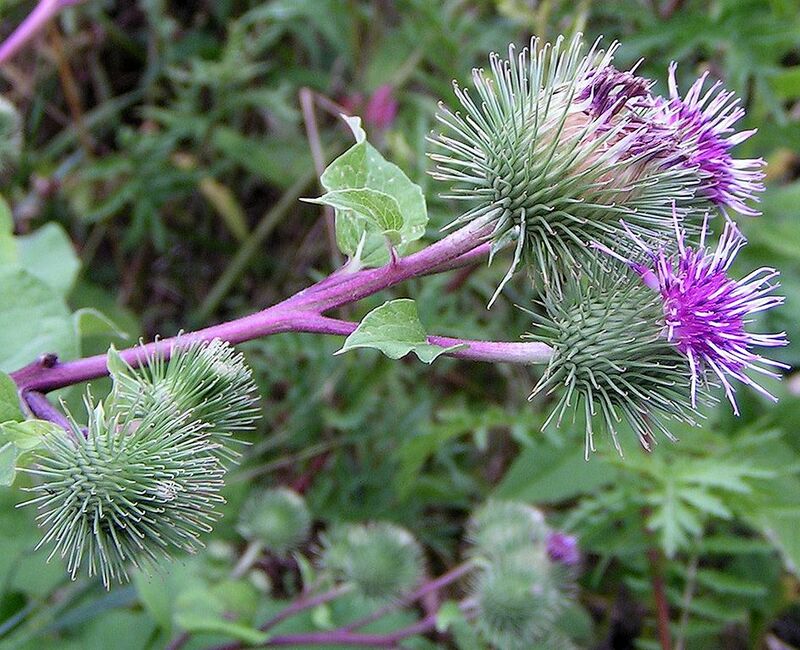 Greater Burdock (Arctium lappa). 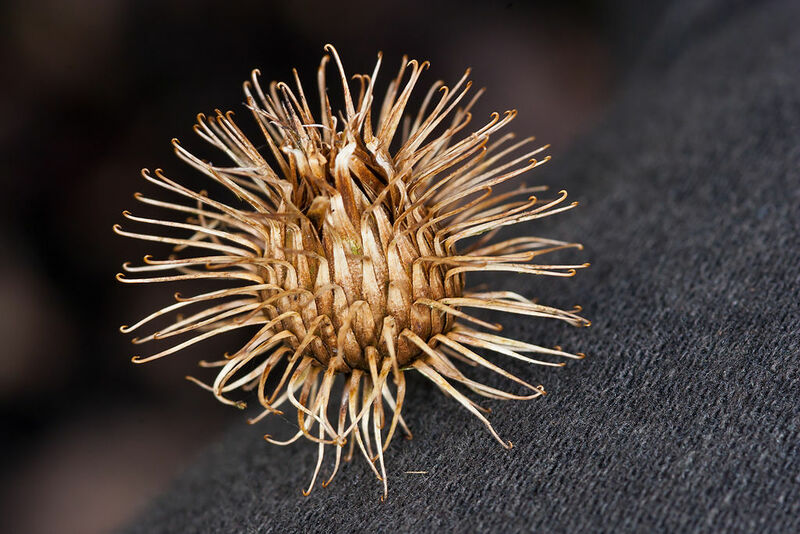 There are many types of Dock plants, but the dock with the burrs that cling to your cloths are the ones you want for the roots - but not when you see burs on them. It is a two year plant (Biennial), in the first year they send up big green Rhubarb looking leaves only, in the 2nd year they have the leaves with a central stalk that flowers and then creates the big marble sized burrs. The root is only good in the fall, or before, of the first year. By the second year they are woody and the flavor is poor, and full of rotted sections. In the first year, they are putting energy into the root for the second year. In the second year, the energy is being used up. A lot of people would think having burdock in the yard would not be a good idea because of the burs. However, if you harvest after the first years' growth, and cut down the stalks of any you miss that start again in the second year, you won't have burs. 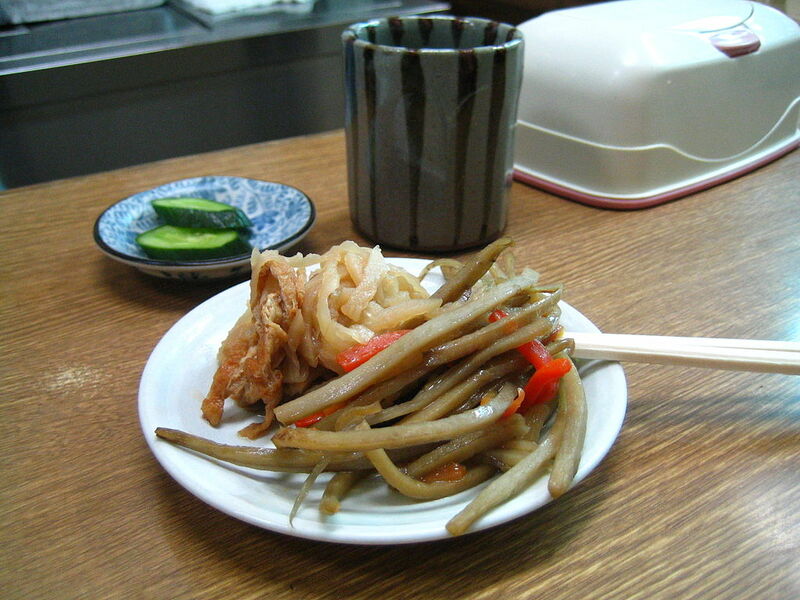 This plant is grown in Japan as a food crop for the root. Is the growing of this plant compatible with Natural farming, Ecoagriculture or Eco friendly agriculture, Ecological farming, Sustainable agriculture, Agroforestry or Agro-sylviculture and Permaculture: You can use Natural farming, no-till garden methods with this plant, but you will have to make sure that you have deep, soft loamy soil before you start. If you find the soils where you are growing them are becoming compacted, you will have to turn the soil to loosen it, otherwise you will get thin, multiple roots that are not good for food. Seeds: For seeds, you have two choices. Gather some in the wild each fall, or grow your own. Like any plant, there are variations within the species. By growing from seeds found in different places, you might find some that you like better than others. It could be they taste better, it could be they grow straighter, smoother roots. If you do find a particularly good strain, growing seeds to preserve the strain would be a good idea. It is as simple as letting one of the plants come up in the second year, and harvest the seeds in the fall. Of course, that means you will have a plant with burs on it. If you have children or pets, or you want to make sure you don't get burs on yourself, simply put a small chicken wire fence around the second year plant. Three or four stakes around the plant that stand about 2 meters (6 feet) tall after being pounded in, and two layers of 1 meter (3 foot) chick wire wrapped around. To hold the chicken wire to the stakes, staple, or what I find is best and makes it easier to take down and save all the chicken wire is to use nylon cable ties. The burs are not a problem until fall of the second year, so you can do this late in the season. Once you get enough seeds, cut the plant down and put the rest of the plant in the garbage or out for the municipal leaf collection. You could put it in the compost pile, but the odds are good it will sprout Burdock the next year. To get the seeds, take burs, break them up gently with rubber gloves on, and black, crescent moon shaped seeds will fall out. Soil & Site: They are super easy to grow, but to grow them with big straight roots takes some preparation. You need to have loose, loamy soil that is deep, 30 cm (12 inches) is the minimum, and 45 cm (18 inches) is about right. You need that depth, as the roots can get that long, and the more room they have, the better quality you get. Next, they really do need full sun. If you have half the day in shade, you will get half as much harvest. You need to have rich, moist soil that is high in nitrogen. This is one plant that responds remarkably to nitrogen. This plant absolutely loves composted manure, so each year before you plant, work composted manure deep into the soil. If you get everything right, you will get great quality roots that are up to 45 cm (18 inches) long or more by 2.5 cm (1 inch) diameter near the crown, and taper slowly down to the tip. If you don't get it right, you will get a mass of tiny rat's tail like roots that are basically useless for food. Planting: Plant by spreading the seeds on the top of the soil, and using a rake, just rake around a little, tamp down lightly, and your done. 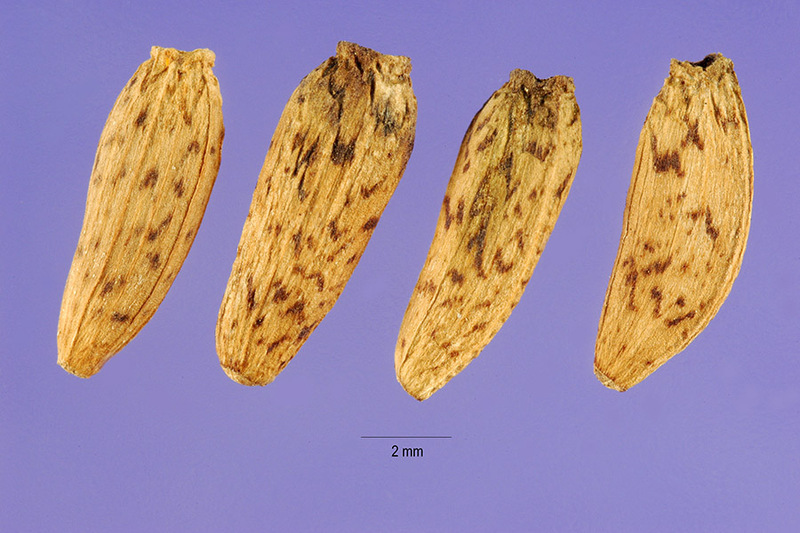 You can save the seeds and plant in the spring or do it in the fall. If you do it in the fall, put down a thin layer of leaves for mulch. If you do it in the spring, plant early, and keep the seeds in a baggie in your freezer over winter. Maintenance: Other than cutting them down in the fall of the first year and harvesting all the roots, there really is nothing to do. They are strong, fast growers, and the huge leaves tend to shade out weeds. Harvesting: Start to harvest when the plant is three months old and has big leaves right into the fall of the first year. 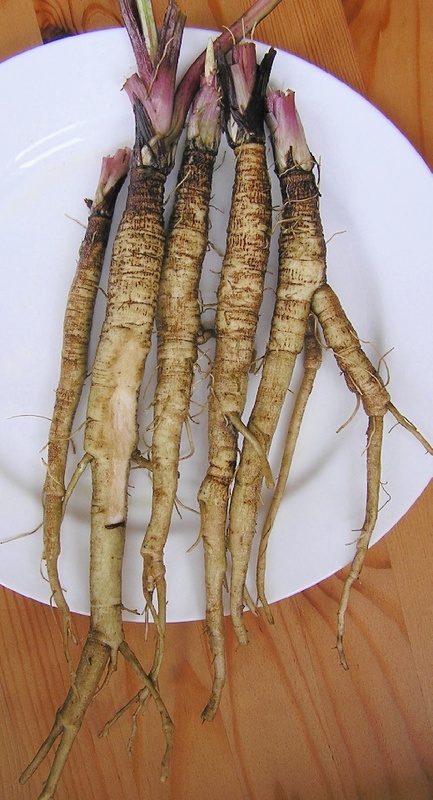 Done this way, you can have fresh Burdock root for a few months. Unless you are specifically trying to grow your own seeds, take every plant out at the end of the first year. The roots are no good for food in the second year, and will produce the burs which can get all over pets and clothes. To harvest, cut off the leaves about 10 cm (4 inches) from the ground and pull straight up if you have loose soil. If your soil has compacted, dig around the root deeply with a shovel to loosen the soil, then pull straight up. 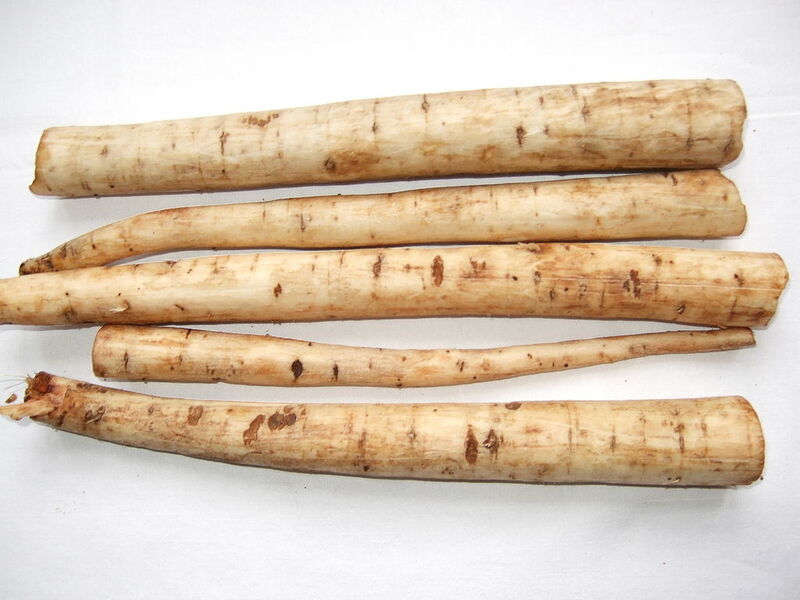 Using: Burdock root is well regarded in the far east for being very healthy to eat. It does give you energy, and too much of it is like too much ginseng – you are wound tight, so don't overdo it by eating a lot every day. If you are a tired or low energy person, this is a good food to give you strength and energy without the nervousness of caffeine. It will keep in the fridge in the vegetable crisper for a week or two. Don't let it dry out or sit in water. The flavor is so strong, that a little goes a long way. You can make tea out of it by simmering chopped, washed root for about 10 minutes in water and drinking straight up. I like it - the taste is wild and strong, but not bitter or unpleasant. A traditional Eastern way of using it for tea is to lightly roast it after washing & chopping into small bits. You do not have to peel it, just wash it very well. You can peel it if you are not sure what condition it is in, or if the root skin is covered with small blemishes. The dark brown skin color is a contrast with the inside, which is a light, off-white color. Cut out any discolored sections. By the way, if you do peel it, you will need a fine, sharp peeler. Many peelers don't work well with the Burdock root. After roasting, put in sealed jars and keep out of light. Will keep for a long time this way. You can also slice it thin and dry in a vegetable drier and store. The ways I use it regularly: Washed and chopped finely in soups in small amounts. It will give a robustness to the flavor, but not overwhelm it. Sort of the way parsnips add to soup, but the flavor is distinct. Another is sliced and added to stir-fry's. It is one of those flavors, that the more you have it, the more you come to like it. Of all the roots and tubers to eat, this is my personal favorite. 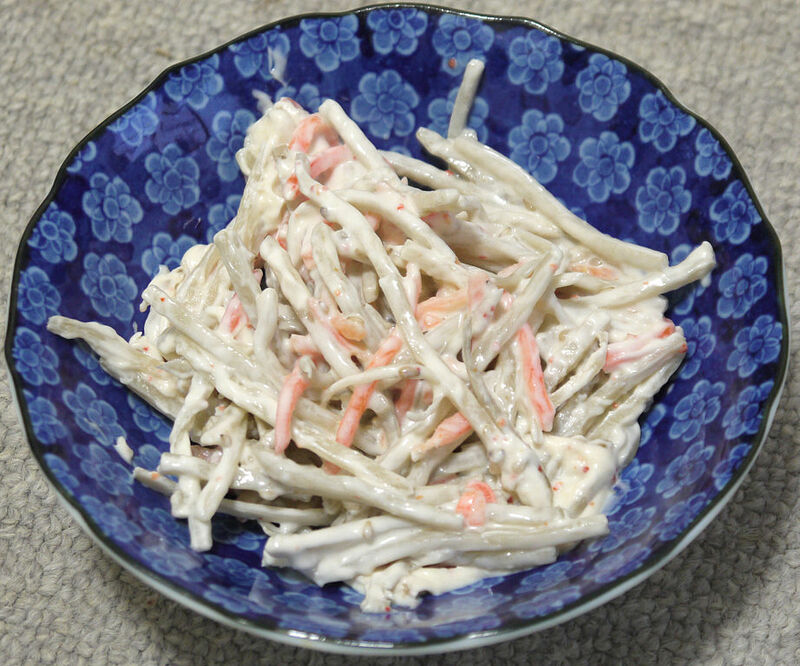 In Japan, it is a regularly used food like we use carrots in the west. Plant Size: First year: low plant, no central stalk, large leaves on stems coming from plant center. Plant leaves are about 30 cm (12 inches) or less off the ground. Second Year: Plant forms a central stalk that can reach almost 3 meters (10 feet), but is usually around 1-2 meters (3 to 6 1/2 feet). Leaf Phyllotaxis (Arrangement) on branch: First year: Leaves come from same spot on the ground (basal leaves). Second year: Alternating on stalk. Leaf Notes: Leaf veins are obvious and recessed giving the leaf a quilted look. Starting from about halfway down the leaf, the central vein and stem is a purple-red. Flowers: Purple flowers on the ends of the green immature burs. Fruit: Little, black, crescent moon shaped seeds inside the marble sized bur that clings to cloths. Habitat: All over - fields, waste areas, disturbed soils, river and creek banks. 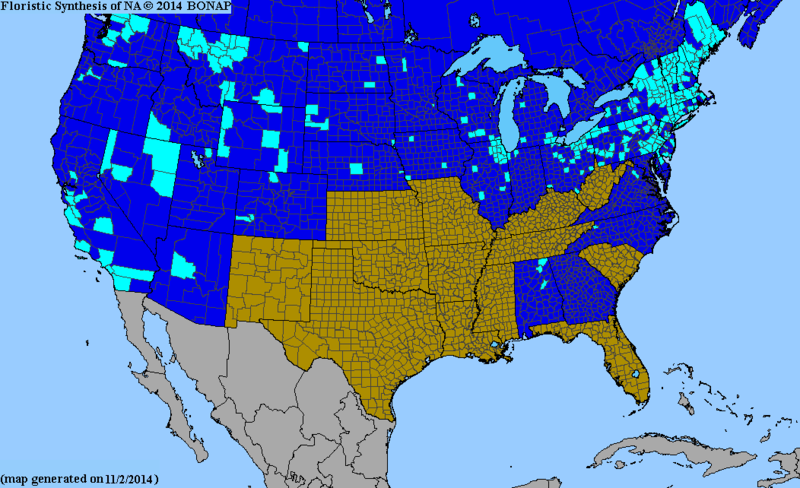 But not in highly shaded areas. Likes rich, moist soils, and grows much larger if the soil is nutrient rich - especially nitrogen. Because of this, huge specimens can be found where there is farm animal manure. 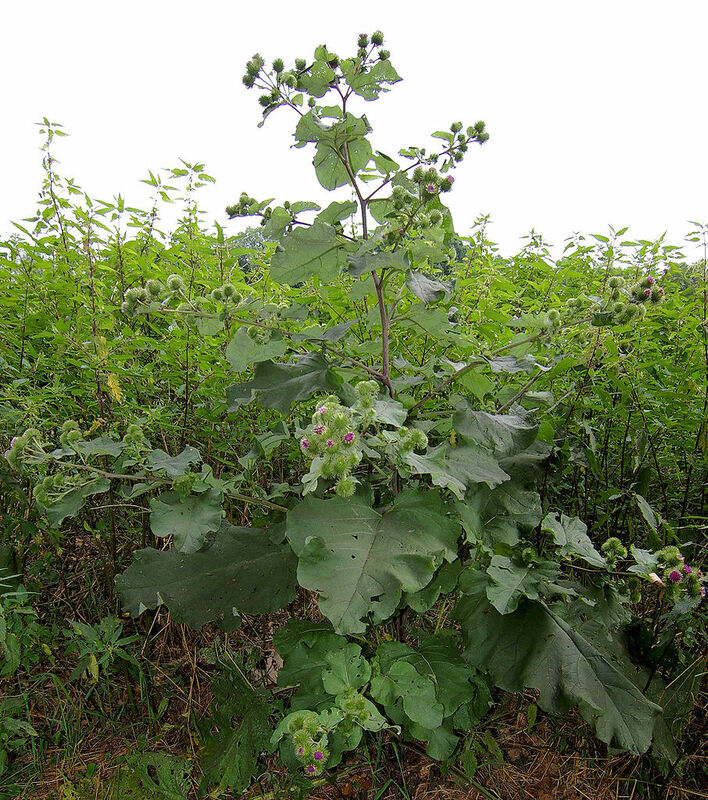 Greater Burdock (Arctium lappa) range. 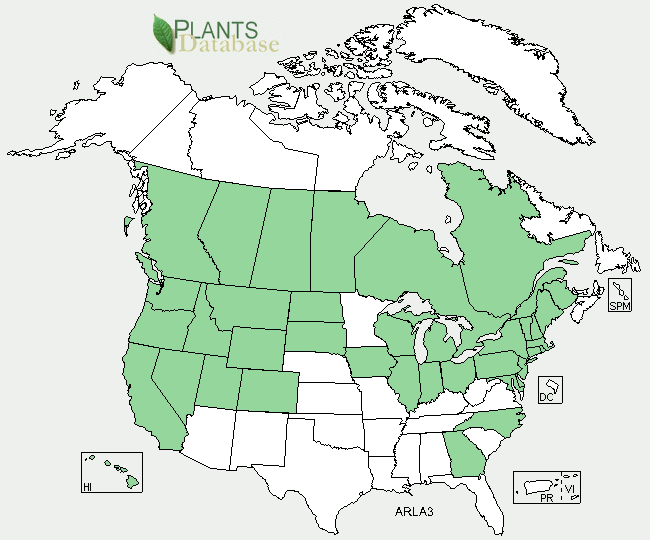 Distribution map courtesy of U. S. Department of Agriculture (USDA Natural Resources Service) and used in accordance with their policies.